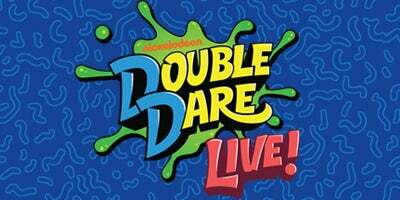 Tickets On Sale Friday, February 8, at 10:00 a.m.
Providence, RI - Charlie Blum Entertainment / CB Entertainment and Red Tail Productions LLC, in partnership with Nickelodeon, announce additional new tour dates for Nickelodeon’s Double Dare Live stage show. Coming off of a successful fall 2018 tour, Double Dare Live -- featuring original host Marc Summers and his beloved sidekick Robin Russo -- will resume touring March 26 in Lancaster, PA, and will play The Providence Performing Arts Center (PPAC) on Saturday, May 18 at 7P. Tickets go on sale to the general public Friday, February 8 at 10:00 a.m. and are available at the PPAC Box Office (220 Weybosset Street in downtown Providence), online at ppacri.org and by phone at (401) 421-ARTS (2787). Tickets are $69.50 - $25; all ticket prices include a $3 per ticket restoration charge and are subject to change without notice. Box Office Hours are Monday through Friday, 10A to 5P; Saturday, 10A to 2P and two hours prior to curtain times on performance days. Please contact Caitlyn for interview and photo requests.